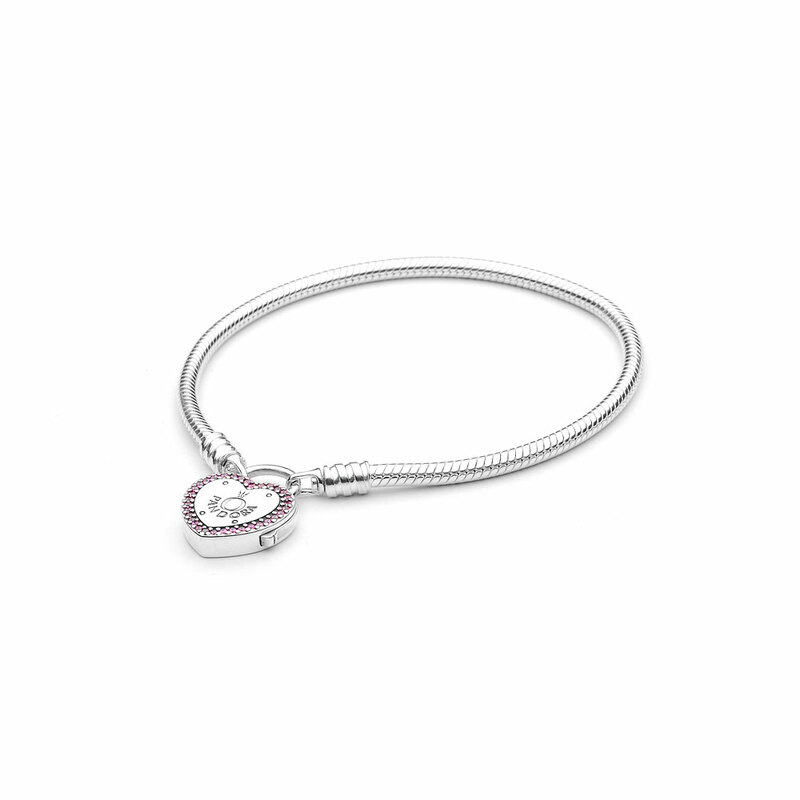 A chic new take on the iconic PANDORA charm bracelet, this new version is decorated with a logo-engraved heart-shaped padlock clasp with pink-hued stones. Serving as a stunning focal point, the clasp is detachable and can also be worn on the corresponding necklace. A symbol of true love and commitment, discover our padlock inspired jewellery and new clasp bracelet concept. Available online or in-store. MOMENTS Smooth Bracelet with Lock Your Promise Clasp is rated 4.5 out of 5 by 20. Rated 5 out of 5 by Tinalyn from Love to have it I been wanting this forever. It's sold everywhere... Pandora please make some more. Rated 5 out of 5 by MsRHarp from HEART! HAERT! HEART!!! I am in love with the newest addition to my Pandora collection! I am wearing it without charms because I don’t want to take away from the classic look of this bracelet. As others have stated, the clasp is somewhat difficult to close- until you figure out how to get your own system on closing it. I found that if I take the heart off the bracelet, then place the bracelet over my wrist, it is easy to then thread the heart clasp through the two ends of the bracelet and I can close the clasp very easily. Doing it this way is much easier than trying to open the clasp, put the bracelet on and close the clasp like you would any other Pandora bracelet. This bracelet may end up replacing my “Return to Tiffany Heart clasp” bracelet!! I couldn’t be happier with this bracelet!! Rated 5 out of 5 by Angel74 from What an absolutely beautiful bracelet My husband brought me this as a Valentines Day gift, and it is absolutely beautiful. I love the padlock clip, it’s different to any other Pandora bangle/bracelet that I have, to say I’m happy with it is an understatement. Thank you Pandora for making such beautiful jewellery. Rated 5 out of 5 by Adrienne from Love Is In the Air!!! I had been waiting on this piece to become available in the stores until I couldn’t stand it any longer. I love hearts so I had to have this bracelet. Every Pandora lover I know is waiting for this, so I just quietly ordered it online. I can’t wait to brag on it. It is rumored that there will be interchangeable clasps, so I can’t wait to see what’s in store. Good job Pandora!!! Rated 5 out of 5 by Sue23 from Beautiful This is a beautiful bracelet the heart is easy to open and close. Rated 5 out of 5 by Pgh mommy from Love the new design! I got this new addition a week ago and I LOVE IT!! It is so wonderful! I use it without any charms, just the bracelet as it think it compliments the other Pandora bracelets nicely. A must have for any Pandora lover! Rated 5 out of 5 by DiamondKiddJs Mom from Absolutely love it! This is my first (of what will be many) Pandora purchase. When I initially saw this bracelet I fell in love, but it was out of stock for the weeks. I checked back periodically and finally saw this one in a size for me so I ordered it immediately. It arrived and I couldn’t have been happier! I get many compliments on it and have only had it for 3 days. I love the snake bracelet and the locket that doubles as the clasp. The clasp closes very tight so there’s no way that it will come off. Over all I am completely satisfied with my purchase and Pandora has gained another customer for life! Rated 4 out of 5 by Skinnimini from I want this bracelet I love Pandora! I’ve been to multiple Jared’s and pandora stores in GA! I’ve even been searching online for this bracelet! Will it be available? ?